North Carolina has set math standards for grades 3-8. At the end of the school year, students must take an End-of-Grade (EOG) test to evaluate their mastery of the concepts. 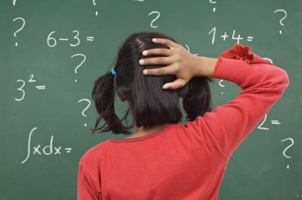 Students that don't do well on the 4th grade EOG test may not be ready for 5th grade math. Keep reading to find out how you can help your 4th grader prepare for this test. Maintain frequent communication with your child's teacher. As a parent, it can be helpful to know the concepts your child is learning and the steps he is taught so that you can provide similar support. Teachers may also be able to give you suggestions for how you can help your child at home. To help your child get used to a test-taking environment, create a quiet space at home and use the practice tests provided by the North Carolina State Board of Education. Use the results from the practice test to identify what areas your child still needs to study. Then, look online for flash cards, games, books, music and other activities. Because the math portion of the exam contains multiple-choice questions, you may also want to teach your son or daughter some test-taking strategies, such as the process of elimination.